Mahatma Gandhi Smruti Khand (memorial) in Old Circuit House, Shahibaug is known to be a sanctum sanctorum where Mahatma Gandhi, Father of nation, was sentenced to six years in prison on charges of sedition 95 years ago. The Smruti Khand houses files and documents like Bapu’s photographs, paintings of his trial, and files and papers related to Gandhiji like untill a month ago. The important holiest place as a source of nationhood and pure rightest’s natonalism has been turned into a warehouse of Patanjali Ayurved Ltd, a company founded by Baba Ramdev. All you will find now is Patanjali ghee, rugs, banners and pamphlets. 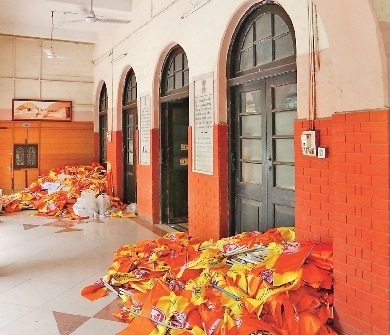 In Smruti Khand, files and documents related to Gandhiji have been swept to a corner to make space for Patanjali ghee, rugs, banners, pamphlets, mattresses for staff, T-shirts and caps that are to be distributed to yoga day participants, etc. 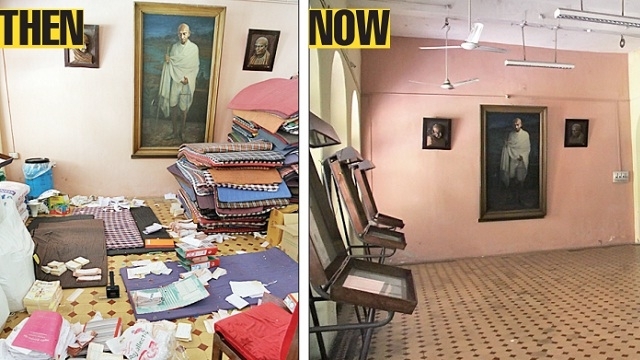 Gandhiji’s pictures that adorn the walls are also partially covered by piles of goods. Earlier on Saturday, when the matter was brought to the notice of Baba Ramdev at press conference in city, he categorically denied any negligence on Patanjali’s side. 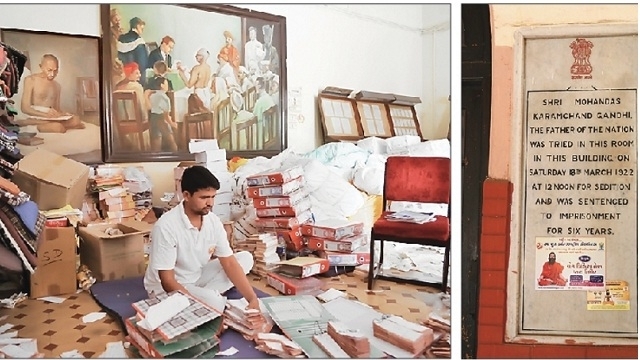 “Patanjali has not stored anything at Smruti Khand, Anyone can go and check,” he said. Since May 25, 12 out of 28 rooms have been given to Patanjali where one room is made into store room while remaining have been occupied by the its staff who are camping for the yoga day’s preparations. Deputy CM Nitin Patel also denied any knowledge of Patanjali using Smruti Khand as a store room. Usually deposit is taken whenever room is given out but in this case, no such deposit is yet taken from Patanjali. According to circuit house sources, the bills will be settled after the state government makes a decision on it. Circuit House is usually meant for state government office-bearers, including ministers, government officials and state guests free of cost as the government bears the expenses. Rs1,300 per day per room (approx) is charged from the relatives and acquaintances if they opt to stay at the circuit house. Sadly, the present India, does not understand a great individual like Mahatma Gandhi. He is not given his due respect. A second Gandhi cannot be born on this earth. He has been a great leader and person, who is an inspiration to many. The irony is that the youth of India, without reading about him, gets carried away by the wrong and distorted facts being shared about him in social media. This is so so sad.